What can we learn about Pete the Cat from his books? I can ask and answer questions about things I do not understand in a book or presentation. CC.K.SL.2 Comprehension and Collaboration: Confirm understanding of a text read aloud or information presented orally or through other media by asking and answering questions about key details and requesting clarification if something is not understood. 1.1.6 Read, view, and listen for information presented in any format (e.g., textual, visual, media, digital) in order to make inferences and gather meaning. I can use the mouse. I can play, fast forward, rewind, stop and pause a video. I can compare and contrast the characters, actions and themes in the videos. What does Pete the Cat see with his magic sunglasses? 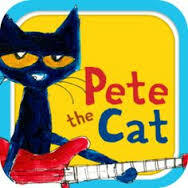 Make your own Pete the Cat matching game. 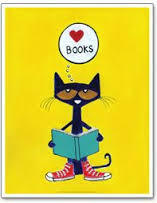 Pete the Cat's Groovy Guide to Life from Harpercollins Childrens on Vimeo.